While taking a walk yesterday, Inkling and I ran into a couple with a young dog. It was a beautiful day — the couple was enjoying the sunshine and watching their pup dash in and out of the snow. A leash dangled from the man’s hand, but it wasn’t connected to the dog’s collar. Without warning, the dog chased a squirrel across the road. Directly in front of an oncoming car. Luckily, the driver had his eyes on the road. He slammed on the brakes, and the car stopped just short of impact. I clipped Inkling to a tree and sprinted over. The owners were checking out their dog and the driver had sprung out of the car. Fortunately the pooch seemed no worse for wear — I don’t think the bumper even made contact with him. After a very brief conversation, which was remarkably pleasant all things considered, the dog and his owners hopped in the car, and the driver ferried them to the animal hospital, just in case. None of us thought that the dog was injured in any way but better to be safe than sorry, especially since injured dogs may act unhurt — a holdover survival instinct from the wild. Were both very happy that the pup was uninjured! The situation could have been much worse, and I’m glad that the little guy didn’t have any perceptible injuries. Yet the accident could have been prevented all together with one simple step. Take the leash and clip it on the dog’s collar. I’m not placing blame or casting judgment. 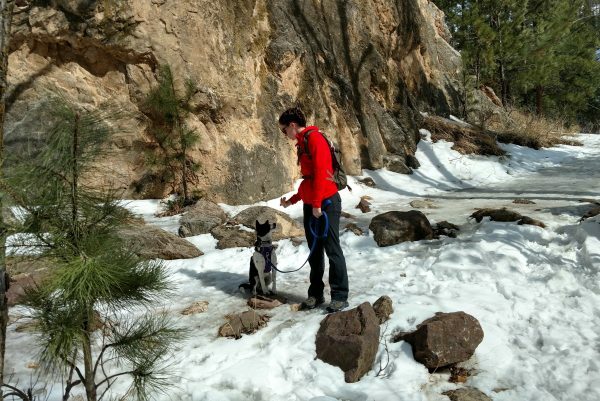 This isn’t about whether a dog deserves to explore off leash. It’s about keeping our best friends safe. Should my dog be on a leash? An estimated 1.2 million dogs in the US die because of car accidents every year. I think that’s 1.2 million too many. We can prevent the majority of these deaths simply by keeping dogs leashed when appropriate. Not every dog is ready to walk off leash. That doesn’t mean anything negative about the dogs or their owners, but some dogs need more training than others before they become reliable without a leash on. Inkling is — thus far — unreliable off leash. So she’s always on one. Very seldom has Inkling ever been in public without a leash. That isn’t because I think dogs always require a tether, it’s because she isn’t ready for it. I love the dog like crazy, but she hasn’t reached a point where I can trust that a squirrel or rabbit won’t lead her on a mile long chase. 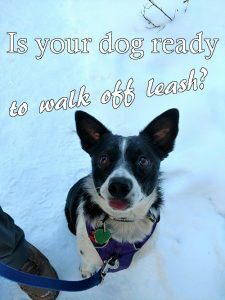 So what makes a dog ready to wander leash-free? 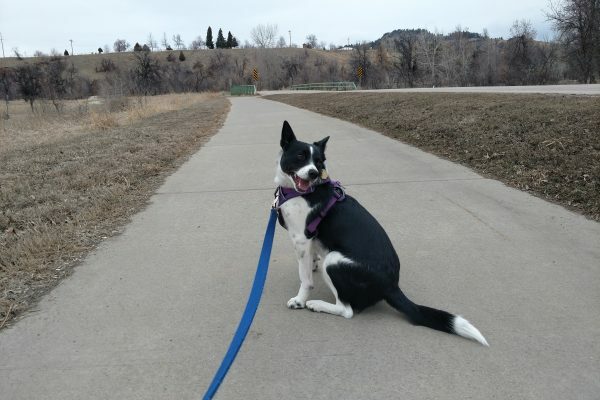 I’m not a veterinarian or professional dog-trainer, nor do I claim to be an expert in all things canine, but reliable recall is the most important thing for your dog to know before you can trust your dog off leash. So ask yourself, does your dog come when called? Every time you call? Even when faced with distractions like other dogs or wildlife? Before you can trust your four-legged friend off leash, you’ll want to know that when called your dog will come running! Learning reliable recall is the best way to ensure your dogs safety. Inkling still needs tons of work coming when called. In controlled circumstances she’s incredibly reliable. Add in distractions though, and her reliability quickly evaporates. Will she ever be ready to explore off leash? I can’t say for sure, but every day we work on the skills she will need to make it happen. Even once Inkling gets the knack for walking off leash, I don’t know that I’ll abandon her leash in town. By far, cars pose probably the greatest risk to an unleashed dog. 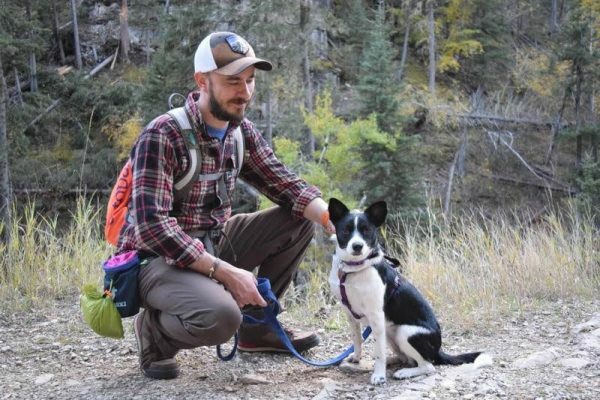 Off leash on the trail? I’m pretty confident that will happen eventually. But chasing a rabbit off of the trail into the woods is a lot more forgiving than chasing a squirrel into traffic. Inkling and Clarissa during a hike. A surprising amount of people have had a negative reaction to posts I’ve made on Instagram about keeping Inkling on leash when hiking. 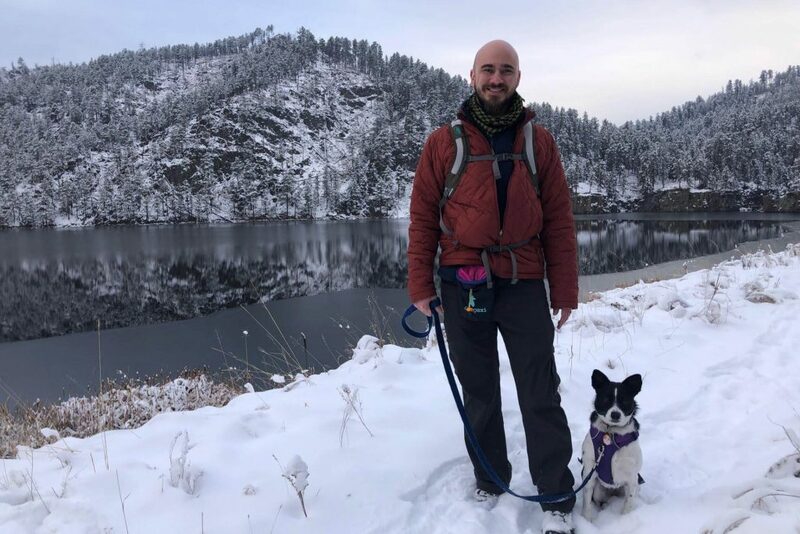 Understand, I’m not suggesting that dogs should never have that freedom — but as a responsible pet-owner, you have to make the determination as to whether or not your dog is ready to walk off leash, and if you’re in an area where it is safe to do so. My personal opinion is that all dogs should learn to walk politely on a leash. 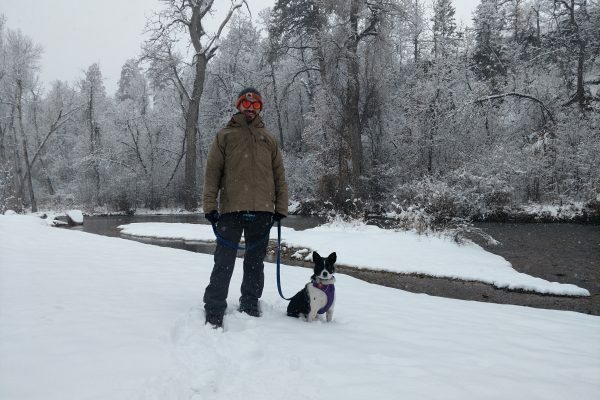 It provides a safe and secure option during walks and hiking, and in some areas leashing your dog is required by law. 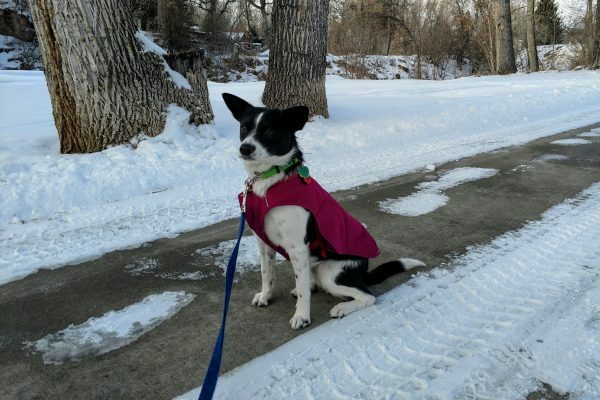 Leash training is more challenging for some dogs than it is for others — Inkling didn’t take to it naturally — but knowing that your dogs won’t pull or jerk when you need to walk them on leash will allow you to share a safe and enjoyable stroll together. Not everyone shares this opinion. Plenty of dogs dart up to Inkling and I during our walks, their owners running to catch up and shouting, “Don’t worry! He’s friendly!” Usually the dogs are friendly, but these owners don’t have control, and if the dog chose to run into the road, their masters would have no recourse but to hope for the best. Not ten minutes after witnessing the pup narrowly escape getting hit by that car, a man allowing his dog to wander freely scoffed at me when I gave Inkling a leash correction. “Just let your dog be free,” he said. “Every dog should have the chance to be a wolf.” Then I watched as his dog ran across the road and he sprinted off in hot pursuit. My little wolf on her leash. Perhaps he has a point — maybe every dog deserves to experience the freedom of a wolf pack. But you can’t keep a wolf as a pet.